There is no better way to lay your ceramic tile floor out than to pop chalk lines into a grid styled layout. Why? For starters, a grid styled layout allows the installer to see exactly where each tile and cut is going to fall. This is especially convenient on high footage floors. In addition, it allows for the installation of a ceramic tile floor that is consistently square throughout. It is very important that you maintain accurate measurements throughout the layout process. Sort through your floor tile to find the largest ceramic tiles of the batch. Lay roughly 3 linear feet of this tile on end to end making sure to insert spacers, if necessary, between the tile grout joints. Measure from the edge of the outermost tile to the edge of the closest 2′ of tile making sure to include the grout joint denominations. Record this measurement. Find a co rner of the room to be tiled that has the longest and straightest walls. Usually these will be exterior and or interior load bearing walls. 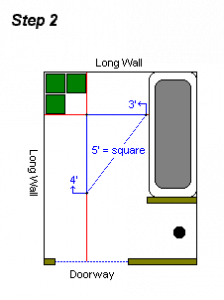 Using the figure you recorded from Step 1, measure and mark the floor off one end of the wall and do the same on the other end. Pop a chalk line between the two marks. 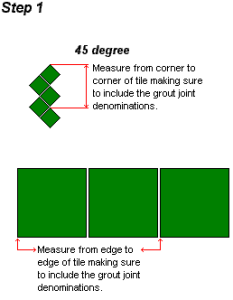 Repeat this step for the intersecting wall. To see if the lines are square, find the spot where the chalk lines intersect and highlight the center. Measure 36″ out from the center and mark the chalk line accordingly. Measure 48″ out on 90 degrees and mark the chalk line accordingly. Now, measure the distance between the center of the two marks you have made. It should amount to 60″. If it does not, either your measurement off the walls were not accurate or one or both of your walls are out of square. Recheck your measurements and re-pop the lines if necessary. If your measurements were accurate check each wall to determined which one is out of square. In most cases it will be an interior wall or the shortest of the two walls. Adjust the chalk line that is out of square and recheck to see if square. In most cases it is best to pop the chalk lines off of your longest wall first. Using the same figure from Step 1, measure, mark, and pop the lines using the chalk line you started with in Step 2 as your starting point. Check your measurements and chalk lines regularly for accuracy and to see if square. 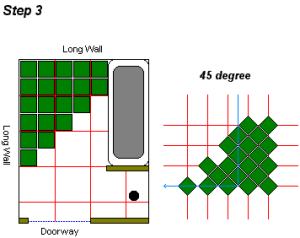 Repeat this step until entire floor has been properly grid out. Start you r ceramic tile installation in the corner you popped the two original lines and remember to keep the first grout joint to the wall. Use a 4′ level to keep your tiles straight or insert spacers on each corner of the tile joints. Typically, grout joint spacing is kept between 1/4″ to 5/16″ wide. If the ceramic tile you selected varies in size by more than an 1/8″ then spacers will prove to be of little use. It is much more important to keep the floor tile properly aligned to the guide lines within each grid square rather than to keep the grout joint widths consistently sized. Can I Lay Ceramic Tile Over an Existing Vinyl Floor?